Selectively Lawless will be on sale on November 13th. I have two new books to review, both of which are officially published this month. The books are Selectively Lawless: The True Story of Emmett Long, An American Original by Asa Dunnington and Frozen Dinners: Memoir of a Fractured Family by Elaine Ambrose. Both books are non-fiction and bring to mind the word “scalliwag”. 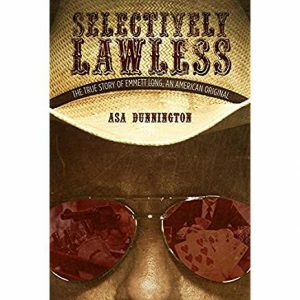 The subject of Selectively Lawless is indeed, a scalliwag, an unconventional character who flouted the law and took the life of an enemy or two, but who had tons of friends (including Pretty Boy Floyd and Benny Binion), and who, in the end found redemption. I recently watched the movie “Old Man with a Gun” starring Robert Redford and this book reminded me of the movie in that the story of the main character. Emmett Long, is so compelling one is curious as to what is happening next. Long is a scalliwag in the era of prohibition. Although the writing seemed to me quite basic, the facts of the story, a man living dangerously for many decades, is compelling. Here was a poor boy who vowed to be somebody and did that through gambling, moonshine, robbery, brothel ownership, hard work and a take charge attitude..even with the authorities. Selectively Lawless is a great tale particularly for a long plane ride where the need for distraction is paramount. 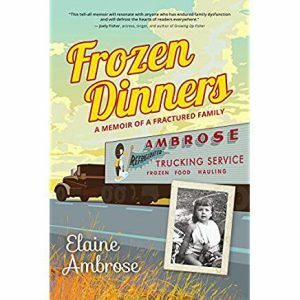 Frozen Dinners is probably the better written of the two books and early on, the book tells how an ambitious young man figured out that a trucks that delivered new-to-the-market TV dinners would have a chance to make money. That idea led to a multi-million-dollar trucking company and later a farming operation. Elaine Ambrose was the man’s daughter and though she says she felt ignored as a child, she was witness to the value of an idea and the work to implement it. I loved reading about the father and his business career. Because of her father’s success, the author was raised with privilege (she had her own horse). However, growing up, Ambrose says she felt “worthless and irrelevant; no one valued me for my uniqueness.” The author then escaped to her room. “I wanted to sing and dance and laugh and tell stories, but such frivolity wasn’t allowed in our strict household. No one cried in my family and I don’t remember any times of boisterous laughter. Alone in my room, I wrote short stories and poetry, reread Little Women, listened to my music and longed to be free.” Prosperity provided that freedom in the form of a college education. Along the way, as Ambrose talks about her life of independence, she finally looks at her father and his success as beneficial to her life. I felt as if I knew that all along. The last part of the book, following the death of her father, focuses on a family squabble over inheritance (one of her brothers is the scalliwag), and frankly this part of the story, though indeed it is part of Ambrose’s life, seemed, to me, a lot like in-print revenge. Understandable? Perhaps. Although early in the book, Ambrose repeatedly notes her father’s absence from the home for work, his strictness in the home and her feelings of loneliness, I was indeed surprised that she dedicated this book to both her parents and one of her brothers. I will be anxious to know how other readers react to both books. Thanks, Diane Taylor, for reading my memoir, “Frozen Dinners.” Maybe you missed the important message about adequate financial planning. My father’s estate was destroyed because my mother was easily manipulated by my older brother, even though my father had prepared and signed extensive documents regarding the distribution of his estate. I’ve been asked to create a workshop in the Boise area about how to manage sibling rivalry and how to write memoirs. Also, I’ll be leading a workshop in Las Vegas on February 16, 2019, about writing and family relationships.